Engineered for maximum durability and long life with impact drivers. Forged, so they fit fasteners more precisely, which reduces stripping and increases the life of the bit. Manufactured with heavy-duty, cold-forged, high grade steel to withstand extremely high torque output. Black oxide finish resists corrosion. High speed steel with a 135 degree split point that eliminates the need for center punch and keeps drill from skating on hard surfaces. Used to drill most ferrous and non ferrous metals. All sizes 3/16" and larger have three flats on the shank for a better grip on the chuck. Jobber length. High speed steel with a 135 degree split point that eliminates the need for center punch and keeps drill from skating on hard surfaces. Used to drill most ferrous and non ferrous metals. All sizes 3/16" and larger have three flats on the shank for a better grip on the chuck. Jobber length. Used in high torque power tools; for use in power drill chuck and chuck adapter; 1/4" hex shank. High speed steel bits used for general purpose drilling in wood, metal and plastic. Jobber length. Used in high torque power tools; for use in power drill chuck and chuck adapter; 1/4" hex shank. High speed steel with a 135 degree split point that eliminates the need for center punch and keeps drill from skating on hard surfaces. Used to drill most ferrous and non ferrous metals. All sizes 3/16" and larger have three flats on the shank for a better grip on the chuck. Jobber length. Each metal drill bit is manufactured to exacting specifications and features a split point that starts on contact with no walking or skating, eliminating the need for a center punch. Offers superior durability, speed and selection to support most general purpose applications. Speed helix design for three times faster drilling than standard bits. Easier drilling, reduced heat and extended drill bit life. For use in steel, copper, aluminum, brass, oak, maple, MDF, pine, PVC, polycarbonate, acrylic, ABS, nylon and composite materials. High speed steel bits used for general purpose drilling in wood, metal and plastic. Jobber length. Specially designed to reduce stripping. Heat treated to resist breakage and wear. Made of shock resistant tool steel for maximum durability. Hardened core for extra strength and reduced breakage. Made of shock resistant tool steel; 1/4" hex shank. Specially designed to reduce stripping. Heat treated to resist breakage and wear. Made of shock resistant tool steel for maximum durability. Hardened core for extra strength and reduced breakage. Made of shock resistant tool steel; 1/4" hex shank. Made of shock resistant tool steel; 1/4" hex shank. High speed steel bits used for general purpose drilling in wood, metal and plastic. Jobber length. Specially designed to reduce stripping. Heat treated to resist breakage and wear. Made of shock resistant tool steel for maximum durability. Hardened core for extra strength and reduced breakage. Each metal drill bit is manufactured to exacting specifications and features a split point that starts on contact with no walking or skating, eliminating the need for a center punch. Offers superior durability, speed and selection to support most general purpose applications. Speed helix design for three times faster drilling than standard bits. Easier drilling, reduced heat and extended drill bit life. For use in steel, copper, aluminum, brass, oak, maple, MDF, pine, PVC, polycarbonate, acrylic, ABS, nylon and composite materials. High speed steel with a 135 degree split point that eliminates the need for center punch and keeps drill from skating on hard surfaces. Used to drill most ferrous and non ferrous metals. All sizes 3/16" and larger have three flats on the shank for a better grip on the chuck. Jobber length. Black oxide for durability, longer life and faster drill times, bits feature a parabolic flute that clears chips faster; split point drills on contact and prevents walking; jobber length. High speed steel with black oxide treatment that reduces friction between bit and workpiece. Split point starts on contact in metal, wood and plastic; eliminates walking or skating when drilling into metal; 135 degree split point on all bits above 1/8"; jobber length. Engineered for maximum durability and long life with impact drivers. Forged, so they fit fasteners more precisely, which reduces stripping and increases the life of the bit. Manufactured with heavy-duty, cold-forged, high grade steel to withstand extremely high torque output. Black oxide finish resists corrosion. Dewalt Insert Bit, Series: FlexTorq, NO 2 Point, Phillips Point, 1 in Overall Length, Hexagonal Shank, 1/4 in Shank, Magnetic Screw Locking, S2 Modified Steel, For Impact Drivers Dewalt Insert Bit, Series: FlexTorq, NO 3 Point, Phillips Point, 1 in Overall Length, Hexagonal Shank, 1/4 in Shank, Magnetic Screw Locking, S2 Modified Steel, For Impact Drivers High speed steel with black oxide treatment that reduces friction between bit and workpiece. Split point starts on contact in metal, wood and plastic; eliminates walking or skating when drilling into metal; 135 degree split point on all bits above 1/8"; jobber length. High speed steel with a 135 degree split point that eliminates the need for center punch and keeps drill from skating on hard surfaces. Used to drill most ferrous and non ferrous metals. All sizes 3/16" and larger have three flats on the shank for a better grip on the chuck. Jobber length. Used in high torque power tools; for use in power drill chuck and chuck adapter; 1/4" hex shank. Used in high torque power tools; for use in power drill chuck and chuck adapter; 1/4" hex shank. High speed steel bits used for general purpose drilling in wood, metal and plastic. Jobber length. High quality S2 chrome molybdenum steel. High quality S2 chrome molybdenum steel. High quality S2 chrome molybdenum steel. High speed steel bits used for general purpose drilling in wood, metal and plastic. Jobber length. Black oxide for durability, longer life and faster drill times, bits feature a parabolic flute that clears chips faster; split point drills on contact and prevents walking; jobber length. High speed steel with a 135 degree split point that eliminates the need for center punch and keeps drill from skating on hard surfaces. Used to drill most ferrous and non ferrous metals. All sizes 3/16" and larger have three flats on the shank for a better grip on the chuck. Jobber length. Geometric design provides the shock absorption zone. Proprietary steel and heat treat process for maximum strength and durability. Forged tip allows for a secure grip and maximum contact eliminating stripping or slipping. Geometric design provides the shock absorption zone. Proprietary steel and heat treat process for maximum strength and durability. Forged tip allows for a secure grip and maximum contact eliminating stripping or slipping. Geometric design provides the shock absorption zone. Proprietary steel and heat treat process for maximum strength and durability. Forged tip allows for a secure grip and maximum contact eliminating stripping or slipping. High speed steel bits used for general purpose drilling in wood, metal and plastic. Jobber length. No-spin shank eliminates the frustration of bit spinning in the chuck. Tapered web provides greater durability to reduce breaking. Size markings are located above the shank to prevent wearing away. Jobber length. Black oxide for durability, longer life and faster drill times, bits feature a parabolic flute that clears chips faster; split point drills on contact and prevents walking; jobber length. Dewalt Insert Bit, Series: FlexTorq, NO 2 Point, Phillips Point, 1 in Overall Length, Hexagonal Shank, 1/4 in Shank, Magnetic Screw Locking, S2 Modified Steel, For Impact Drivers No-spin shank eliminates the frustration of bit spinning in the chuck. Tapered web provides greater durability to reduce breaking. Size markings are located above the shank to prevent wearing away. Jobber length. 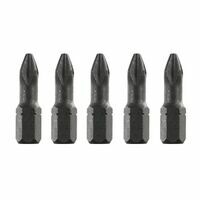 Black oxide for durability, longer life and faster drill times, bits feature a parabolic flute that clears chips faster; split point drills on contact and prevents walking; jobber length. 10X life over standard impact bits. High-visibility sleeve with laser-etched markings for user convenience. Black oxide for durability, longer life and faster drill times, bits feature a parabolic flute that clears chips faster; split point drills on contact and prevents walking; jobber length. Bosch Power Screwdriver Bit, NO 1 Point, Phillips, P1 Point, 2 in Overall Length, Hexagonal Shank, 1/4 in Shank, Steel, Black Oxide, Impact Tough Hardness, For Impact Driver High quality S2 chrome molybdenum steel. Geometric design provides the shock absorption zone. Proprietary steel and heat treat process for maximum strength and durability. Forged tip allows for a secure grip and maximum contact eliminating stripping or slipping. Geometric design provides the shock absorption zone. Proprietary steel and heat treat process for maximum strength and durability. Forged tip allows for a secure grip and maximum contact eliminating stripping or slipping. Engineered for extreme durability. Made from proprietary steel and heat treated to control hardness. Geometric design provides shock absorption zone to extend life. The forged tip allows for a secure grip and maximum contact, eliminating stripping or slipping. Includes: (1) Phillips Shockwave power bit; 1/4'' diameter. No-spin shank eliminates the frustration of bit spinning in the chuck. Tapered web provides greater durability to reduce breaking. Size markings are located above the shank to prevent wearing away. Jobber length. Each metal drill bit is manufactured to exacting specifications and features a split point that starts on contact with no walking or skating, eliminating the need for a center punch. Offers superior durability, speed and selection to support most general purpose applications. Speed helix design for three times faster drilling than standard bits. Easier drilling, reduced heat and extended drill bit life. For use in steel, copper, aluminum, brass, oak, maple, MDF, pine, PVC, polycarbonate, acrylic, ABS, nylon and composite materials. Black oxide for durability, longer life and faster drill times, bits feature a parabolic flute that clears chips faster; split point drills on contact and prevents walking; jobber length. Performance-optimized S2 steel construction for extended life. Ideal for driving screws in a variety of heavy duty applications including metal fastening, deck building, framing, and installing plywood subfloor. For use with high torque impact drivers and driver-drills. Includes: (2) ImpactX #2 Phillips bits. Xtended Torsion Zone to absorb high-torque of new impact drivers. Precision engineered for a tighter fit and less cam-out. Heat-treated manufacturing for stronger bit. High visibility sleeve with laser etched markings for user convenience. Contains (1) Impact Tough 1" Phillips Square No 2 Insert Bits. High speed steel with a 135 degree split point that eliminates the need for center punch and keeps drill from skating on hard surfaces. Used to drill most ferrous and non ferrous metals. All sizes 3/16" and larger have three flats on the shank for a better grip on the chuck. Jobber length. High speed steel bits used for general purpose drilling in wood, metal and plastic. Jobber length. Dewalt Insert Bit, Series: FlexTorq, NO 2 Point, Phillips Point, 2 in Overall Length, Hexagonal Shank, 1/4 in Shank, Magnetic Screw Locking, S2 Modified Steel, For Impact Drivers Each metal drill bit is manufactured to exacting specifications and features a split point that starts on contact with no walking or skating, eliminating the need for a center punch. Offers superior durability, speed and selection to support most general purpose applications. Speed helix design for three times faster drilling than standard bits. Easier drilling, reduced heat and extended drill bit life. For use in steel, copper, aluminum, brass, oak, maple, MDF, pine, PVC, polycarbonate, acrylic, ABS, nylon and composite materials. High speed steel with black oxide treatment that reduces friction between bit and workpiece. Split point starts on contact in metal, wood and plastic; eliminates walking or skating when drilling into metal; 135 degree split point on all bits above 1/8"; jobber length. For impact drills and drivers. Engineered for maximum durability and long life with impact drivers. Fit fasteners more precisely, which reduces stripping. Manufactured with heavy-duty, cold-forged, high grade steel to withstand high torque output. Black oxide finish resists corrosion. Each metal drill bit is manufactured to exacting specifications and features a split point that starts on contact with no walking or skating, eliminating the need for a center punch. Offers superior durability, speed and selection to support most general purpose applications. Speed helix design for three times faster drilling than standard bits. Easier drilling, reduced heat and extended drill bit life. For use in steel, copper, aluminum, brass, oak, maple, MDF, pine, PVC, polycarbonate, acrylic, ABS, nylon and composite materials. Tempered steel for increased durability. Ribbed tip withstands up to 50 percent more torque before camout. Proven sub-zero tempering process gives these bits long life and increased durability. High speed steel features a black body and gold flute with Turbomax tip for burr-free holes. Exact centering; no walking on straight and curved surfaces. Three flatted shank on 3/16" and above for better chuck grip. Jobbers length. For impact drills and drivers. Engineered for maximum durability and long life with impact drivers. Fit fasteners more precisely, which reduces stripping. Manufactured with heavy-duty, cold-forged, high grade steel to withstand high torque output. Black oxide finish resists corrosion. For impact drills and drivers. Engineered for maximum durability and long life with impact drivers. Fit fasteners more precisely, which reduces stripping. Manufactured with heavy-duty, cold-forged, high grade steel to withstand high torque output. Black oxide finish resists corrosion. For impact drills and drivers. Engineered for maximum durability and long life with impact drivers. Fit fasteners more precisely, which reduces stripping. Manufactured with heavy-duty, cold-forged, high grade steel to withstand high torque output. Black oxide finish resists corrosion. High speed steel with a 135 degree split point that eliminates the need for center punch and keeps drill from skating on hard surfaces. Used to drill most ferrous and non ferrous metals. All sizes 3/16" and larger have three flats on the shank for a better grip on the chuck. Jobber length. High speed steel with black oxide treatment that reduces friction between bit and workpiece. Split point starts on contact in metal, wood and plastic; eliminates walking or skating when drilling into metal; 135 degree split point on all bits above 1/8"; jobber length. Industrial deck bit tip that is shock resistant steel for maximum durability, hardened core for extra strength and reduced breakage, heat treated to resist breakage and wear and specially designed to reduce stripping; 1/4" hex shank. No-spin shank eliminates the frustration of bit spinning in the chuck. Tapered web provides greater durability to reduce breaking. Size markings are located above the shank to prevent wearing away. Jobber length. Pilot point tip starts on contact for clean, accurate holes and reduces lock-up on breakthrough, bit spinning in the chuck has been eliminated, and tapered web provides greater durability to reduce breaking. Size markings are located above the shank to prevent wearing away. Jobber length. Specially designed to reduce stripping. Heat treated to resist breakage and wear. Made of shock resistant tool steel for maximum durability. Hardened core for extra strength and reduced breakage. High speed steel features a black body and gold flute with Turbomax tip for burr-free holes. Exact centering; no walking on straight and curved surfaces. Three flatted shank on 3/16" and above for better chuck grip. Jobbers length. High speed steel with black oxide treatment that reduces friction between bit and workpiece. Split point starts on contact in metal, wood and plastic; eliminates walking or skating when drilling into metal; 135 degree split point on all bits above 1/8"; jobber length. No-spin shank eliminates the frustration of bit spinning in the chuck. Tapered web provides greater durability to reduce breaking. Size markings are located above the shank to prevent wearing away. Jobber length. No-spin shank eliminates the frustration of bit spinning in the chuck. Tapered web provides greater durability to reduce breaking. Size markings are located above the shank to prevent wearing away. Jobber length. Each metal drill bit is manufactured to exacting specifications and features a split point that starts on contact with no walking or skating, eliminating the need for a center punch. Offers superior durability, speed and selection to support most general purpose applications. Speed helix design for three times faster drilling than standard bits. Easier drilling, reduced heat and extended drill bit life. For use in steel, copper, aluminum, brass, oak, maple, MDF, pine, PVC, polycarbonate, acrylic, ABS, nylon and composite materials. High speed steel bits used for general purpose drilling in wood, metal and plastic. Jobber length. Geometric design provides the shock absorption zone. Proprietary steel and heat treat process for maximum strength and durability. Forged tip allows for a secure grip and maximum contact eliminating stripping or slipping. Made of shock resistant tool steel; 1/4" hex shank. Geometric design provides the shock absorption zone. Proprietary steel and heat treat process for maximum strength and durability. Forged tip allows for a secure grip and maximum contact eliminating stripping or slipping. High speed steel features a black body and gold flute with Turbomax tip for burr-free holes. Exact centering; no walking on straight and curved surfaces. Three flatted shank on 3/16" and above for better chuck grip. Jobbers length. High speed steel with a 135 degree split point that eliminates the need for center punch and keeps drill from skating on hard surfaces. Used to drill most ferrous and non ferrous metals. All sizes 3/16" and larger have three flats on the shank for a better grip on the chuck. Jobber length. Bosch Power Screwdriver Bit, NO 2 Point, Phillips, P2 Point, 1 in Overall Length, Hexagonal Shank, 1/4 in Shank, Steel, Black Oxide, Impact Tough Hardness, For Impact Driver Pilot point tip starts on contact for clean, accurate holes and reduces lock-up on breakthrough, bit spinning in the chuck has been eliminated, and tapered web provides greater durability to reduce breaking. Size markings are located above the shank to prevent wearing away. Jobber length. No-spin shank eliminates the frustration of bit spinning in the chuck. Tapered web provides greater durability to reduce breaking. Size markings are located above the shank to prevent wearing away. Jobber length. Specially designed to reduce stripping. Heat treated to resist breakage and wear. Made of shock resistant tool steel for maximum durability. Hardened core for extra strength and reduced breakage. High speed steel with a 135 degree split point that eliminates the need for center punch and keeps drill from skating on hard surfaces. Used to drill most ferrous and non ferrous metals. All sizes 3/16" and larger have three flats on the shank for a better grip on the chuck. Jobber length. High speed steel with black oxide treatment that reduces friction between bit and workpiece. Split point starts on contact in metal, wood and plastic; eliminates walking or skating when drilling into metal; 135 degree split point on all bits above 1/8"; jobber length. Keeps pumps cooler than regular oil and is suitable for all climates. Convenient pour spout container with re-sealable cap. Oil contains rust and corrosion additives, anti-wear additives, foam suppressant and dispersant for system cleanliness. High speed steel bits used for general purpose drilling in wood, metal and plastic. Jobber length. Female pressure washer screw. Female nominal pipe thread x M22. High speed steel with a 135 degree split point that eliminates the need for center punch and keeps drill from skating on hard surfaces. Used to drill most ferrous and non ferrous metals. All sizes 3/16" and larger have three flats on the shank for a better grip on the chuck. Jobber length. 135? split provides greater durability to reduce breaking. Core diameter reduces breaking. Black Oxide for greater wear resistance. Tapered web eliminates the frustration of bit spinning in the chuck. Size marking located above the shank. High speed steel with black oxide treatment that reduces friction between bit and workpiece. Split point starts on contact in metal, wood and plastic; eliminates walking or skating when drilling into metal; 135 degree split point on all bits above 1/8"; jobber length. High speed steel with black oxide treatment that reduces friction between bit and workpiece. Split point starts on contact in metal, wood and plastic; eliminates walking or skating when drilling into metal; 135 degree split point on all bits above 1/8"; jobber length. Impact Ready accessories deliver exceptional performance for extreme torque applications. FlexTorq bits feature an extended FlexTorq zone to transfer optimal torque in hard joint applications, providing durability and longer life. The bit tip is CNC machined for a precise fit. Magnetic Screw Lock sleeve minimizes drops and reduces wobbles. Impact ready bits with flextime have increased durability and long life. Single end. Impact rated. Drive Size: 6. Overall Length: 6". Point Size: No 2. Point Type: Phillips. Shank Size: 1/4". Magnesium Phosphate finish. Pilot point tip starts on contact for clean, accurate holes and reduces lock-up on breakthrough, bit spinning in the chuck has been eliminated, and tapered web provides greater durability to reduce breaking. Size markings are located above the shank to prevent wearing away. Jobber length. High speed steel bits used for general purpose drilling in wood, metal and plastic. Jobber length. For impact drills and drivers. Engineered for maximum durability and long life with impact drivers. Fit fasteners more precisely, which reduces stripping. Manufactured with heavy-duty, cold-forged, high grade steel to withstand high torque output. Black oxide finish resists corrosion. For impact drills and drivers. Engineered for maximum durability and long life with impact drivers. Fit fasteners more precisely, which reduces stripping. Manufactured with heavy-duty, cold-forged, high grade steel to withstand high torque output. Black oxide finish resists corrosion. For impact drills and drivers. Engineered for maximum durability and long life with impact drivers. Fit fasteners more precisely, which reduces stripping. Manufactured with heavy-duty, cold-forged, high grade steel to withstand high torque output. Black oxide finish resists corrosion. High speed steel with a 135 degree split point that eliminates the need for center punch and keeps drill from skating on hard surfaces. Used to drill most ferrous and non ferrous metals. All sizes 3/16" and larger have three flats on the shank for a better grip on the chuck. Jobber length. High speed steel features a black body and gold flute with Turbomax tip for burr-free holes. Exact centering; no walking on straight and curved surfaces. Three flatted shank on 3/16" and above for better chuck grip. Jobbers length. 1/4" Female x 1/4" socket. 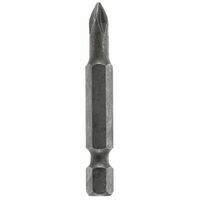 6'' power bits are engineered for extreme durability and long life. Made from proprietary steel and heat treated to control hardness. The forged tip allows for a secure grip and maximum contact, eliminating stripping or slipping. Ideal for heavy duty impact applications for all drilling and fastening needs. Includes P2 Phillips Shockwave 6'' power bit. Industrial deck bit tip that is shock resistant steel for maximum durability, hardened core for extra strength and reduced breakage, heat treated to resist breakage and wear and specially designed to reduce stripping; 1/4" hex shank. High speed steel used to drill most ferrous and nonferrous metals; 135 degree split point eliminates need for center punch and keeps drill from skating on hard surfaces. All sizes 3/16" and larger have 3 flats on the shank so the drill chuck gets a better grip on the drill bit. All sizes 13/32" and above have a 3/8" reduced shank. Jobbers length. Suitable for clipstrips or dump bins. Includes one each: 1/16", 3/32", 1/8", 5/32", 3/16", 7/32", 1/4", and pouch. Made of high-grade S2 tool steel and milled for precise fit. Specifically built for the higher torque requirements of power tools; can be used with drill chuck or quick change chuck adapter in applications such as appliance, automotive, aviation, decking, drywall, electronics, furniture assembly, general construction and HVACR; 1/4" hex shank. Made of high-grade S2 tool steel and milled for precise fit. Specifically built for the higher torque requirements of power tools; can be used with drill chuck or quick change chuck adapter in applications such as appliance, automotive, aviation, decking, drywall, electronics, furniture assembly, general construction and HVACR; 1/4" hex shank. Made of high-grade S2 tool steel and milled for precise fit. Specifically built for the higher torque requirements of power tools; can be used with drill chuck or quick change chuck adapter in applications such as appliance, automotive, aviation, decking, drywall, electronics, furniture assembly, general construction and HVACR; 1/4" hex shank. Black oxide for durability, longer life and faster drill times, bits feature a parabolic flute that clears chips faster; split point drills on contact and prevents walking; jobber length. High speed steel bits used for general purpose drilling in wood, metal and plastic. Jobber length. Each metal drill bit is manufactured to exacting specifications and features a split point that starts on contact with no walking or skating, eliminating the need for a center punch. Offers superior durability, speed and selection to support most general purpose applications. Speed helix design for three times faster drilling than standard bits. Easier drilling, reduced heat and extended drill bit life. For use in steel, copper, aluminum, brass, oak, maple, MDF, pine, PVC, polycarbonate, acrylic, ABS, nylon and composite materials. Used in high torque power tools; for use in power drill chuck and chuck adapter; 1/4" hex shank.